Ambika Wali, a resident of Billerica, MA is a Risk Consultant for Ernst & Young (E&Y). She is a graduate of Bentley College, class of 2005, with a Bachelors Degree in Corporate Finance & Accounting and a minor in Psychology. She is an active member of the South Asian community and at such a young age, serves as Secretary of IAGB, the largest Indian-American organization in New-England. She was one of the founders of the South Asian Student Association (SASA) at Bentley College and also President of her high school graduating class. Coming from a family which has remained actively involved in serving various communities and groups may have guided the all round development in Ambika. Her parents are Neelam and Anupam Wali; Neelam is Chairperson of the Asian American Commission in Massachusetts and Anupam has been President of the Indian Association of Greater Boston. Even with these impressive credentials, Ambika is featured in our Youth Spotlight for another reason and that is - Her efforts with the Jhumka Dance Company. Curious? We will let you in soon. Actually, we will let Ambika answer your questions. 1. Ambika, please let us know about Jhumka Dance Company and what was your inspiration behind starting it? Ambika: Two years after graduating from college and beginning my professional career in the working world, I encountered a real lack of opportunities to participate in an art form I have loved since my childhood: dance. My sisters and I have been avid dancers for as long as I can recall, beginning with tap, jazz, and ballet, completing a brief stint of gymnastics, and ultimately receiving our formal training in Indian Classical Dance. Since then, we have performed in cultural shows for South Asian Organizations across the country, later transitioning into various other forms of dance and incorporating our traditional training with various fusion styles. Ultimately, the impetus to form a performance group took hold only after I graduated from college. As an Indian American, it is common to study dance when you are young, but once you reach adulthood a lack of classes, peers, and performance opportunities makes it increasingly more difficult to continue dancing. I found that I really missed it. I tried to get my sisters and some of our friends together to continue the tradition of Indian dance, but we knew that there were more people just like us out there. While I could have taken up salsa, ballroom, or hip-hop (dance forms with large adult followings), what I really wanted to do was create Indian inspired dance classes for working professionals just like me. Four months after inception, The Jhumka Dance Company has over 100 interested dancers, 6 choreographers, and almost a dozen performances lined up. The basic idea behind the company is to help spread cultural awareness, further the art of Indian dance, and recruit individuals who have always wanted to dance but never had the opportunity. Therefore, all our choreographers are volunteers and all our adult dance classes are free of charge. We are expanding more rapidly than anticipated and interest has been overwhelming. Currently we have a Greater Boston Chapter, and our long term goals are to expand into various cities across the country. 2. Tell us about the early phases of Jhumka and how you got others interested and involved. Ambika: Jhumka originally began through word of mouth with dancers that we have worked with over the years. After the response received from the group of dancers that we worked with, we decided to really go forward with this idea. We used online social networks and communities to spread the word about our mission as well as recruited through local Indian Organizations and Universities. Our last outreach was over a month ago but we continue to get daily hits on the website and excited, enthusiastic emails from both dancers and choreographers on a daily basis. 3. You have a demanding job that requires extensive travel. What makes you committed to not only finding time for Jhumka but to leading such an effort? Ambika: We all have busy lives and (hopefully) jobs we love at the end of the day. The truth is that my professional career is not a hindrance to Jhumka but, rather, it is what drives me to dance. Everyone needs balance in their lives and my professional career is a wonderful mirror to the lively and carefree time that I spend contributing to the Jhumka name. My professional career teaches me about being driven and determined while dancing teaches me how to be emotionally connected and expressive. That being said, determination helps me tremendously in my dancing and emotional awareness is a cornerstone of effective professional behavior. In the end, I do it because I love it. What better reason in the world can there be than simply doing something because you love it. 4. Tell us about your recent events and the upcoming performances of Jhumka. Ambika: We performed in our first show back in August for Independence Day and have run two subsequent classes (one in the Bollywood Semi-Classical style and one in Bollywood Hip-Hop Fusion). Both classes performed during the Diwali cultural shows in the Greater Boston area. We have many shows lined up for the upcoming year and are looking into branching out from South Asian shows into International cultural festivals in order to spread our mission. Dates for upcoming shows, pictures, and videos our performances can be found on our website..
5. Your sisters Anjali and Nisha as well as some of your close friends are also actively involved with Jhumka. Tell us some interesting bits about what goes on behind the scenes of your performances. Ambika: The best thing about this initiative is that, if it takes a village to raise a child, my village is all right here. Our personalities within the executive board and founding members complement each other so well and we each bring something different to the table. I admit that in terms of organization and leadership, I tend to fall right into that role. I think it is a result of being an older sister. I usually am the main contact between the dancers and Jhumka. I also take on the role of organizing the dancers and choreographers together for the various dance styles. That being said, Nisha is wise beyond her years and often surprises me with her insight into the problems that we could encounter with each decision that we make. She attends all of our meetings (when she can make it) and has already helped to hedge our risks in many situations. 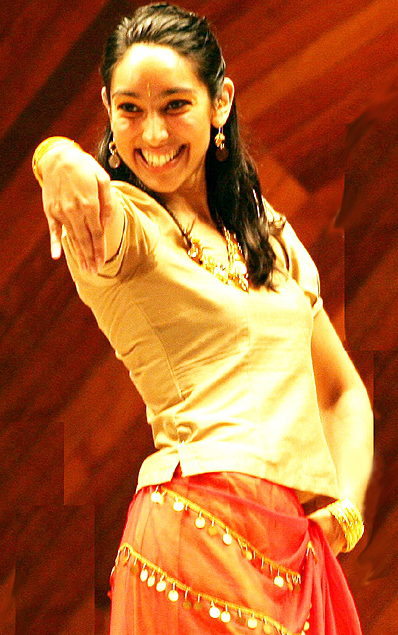 Anjali has a great teaching style and the ability to breakdown steps so that beginner dancers dont feel overwhelmed. Our close friend who we started Jhumka with is a social worker and is very familiar with non-profits, their operations, and ways that they can function while doing good things for the community. All of us work, go to school, and sometimes do both all the while being both dancers and choreographers under the Jhumka name. We have encountered everything from last minute costume alterations to differing personalities within our classes. We take it all in stride and realize that every move we make sets a precedent for the future. While we are learning, we are also moving forward confidently and with a business model that we love. 6. We at Shehjar believe that Jhumka is a very positive outlet for our young adults to direct their creative energies. How can Jhumka be replicated in cities around the world by other young adults? Ambika: Our hope is definitely to expand the Jhumka name to various cities once we are fully developed in the Greater Boston area. If people are interested in learning more about the process and concept they should feel free to contact us at jhumkadancecompany@gmail.com . 7. What are your plans with Jhumka, going forward? Ambika: For now, we are focusing on building a network of dancers and choreographers that believe in the Jhumka mission. Right now we are developing a lot of the infrastructure for the organization in terms of websites as well as databases of dancers, upcoming shows, and past performances. As we run more classes and perform in more shows, our hope is to become a household name that working professionals automatically think of when they start to miss how dancing used to be.